Pay no attention to the woman behind the curtain. Any question you could possibly ask may be considered “Gotcha Journalism.” If she answers well, it shows her fitness, if not… damned liberal MSM bias. **I’ve been so focused on state government, I haven’t really focused much on the war in Iraq. – interview with Alaska Business Monthly, March 2007. **As for that VP talk all the time, I’ll tell you, I still can’t answer that question until somebody answers for me what is it exactly that the VP does every day? –interview with CNBC’s “Kudlow & Co”, July 2008. One can only imagine the discussion with Cheney. **As Putin rears his head and comes into the air space of the United States of America, where– where do they go? It’s Alaska. It’s just right over the border. –explaining why Alaska’s proximity to Russia gives her foreign policy experience, interview with CBS’s Katie Couric, Sept. 24, 2008. In fact, the Air Force reports that this has not happened once since she took office. **I told the Congress, ‘Thanks, but no thanks,’ on that Bridge to Nowhere. 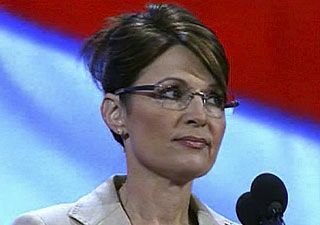 In point of fact, Palin campaigned in favor of the bridge and took the cash to build a road to nowhere. As for being against earmarks, according to the watchdog group Taxpayers for Common Sense, Palin hired a Washington lobbyist to secure earmarks for Wasilla, when she was mayor. The town of 6,715 received nearly $27 million in federal dollars from 2000 to 2003. That includes $1.9 million for public transit and $15 million for a rail line connecting Wasilla to the hometown of Alaska Senator Ted Stevens. As Governor, Palin requested $198 million in earmarks for Alaska in next year’s federal budget, which includes $25 million for Coastal Salmon Recovery and $3.2 million for sea lion biological research. **That’s exactly what we’re going to do in a Palin and McCain administration. –elevating herself to the top of the ticket, Cedar Rapids, Iowa, Sept. 18, 2008. **I think God’s will has to be done in unifying people and companies to get that gas line built, so pray for that. –-on the $30 billion national gas pipeline project that she wanted built in the state, speaking to students the Wasilla Assembly of God, June 2008. She told Katie Couric that she would never say that she knows what God’s will is. I would hope God has higher priorities than a pipeline in Alaska. **Perhaps so. — when asked if we may need to go to war with Russia because of the Georgia crisis, ABC News interview, Sept. 11, 2008. Is it God’s will? **I’m the mayor, I can do whatever I want until the courts tell me I can’t.‘ , as quoted by former City Council Member Nick Carney, after he raised objections about the $50,000 she spent renovating the mayor’s office without approval of the city council. No need to know what the law is in that case. **Let me speak specifically about a credential that I do bring to this table, Charlie, and that’s with the energy independence that I’ve been working on for these years as the governor of this state that produces nearly 20 percent of the U.S. domestic supply of energy, that I worked on as chairman of the Alaska Oil and Gas Conservation Commission, overseeing the oil and gas development in our state to produce more for the United States. In answer to Charlie Gibson’s question: “When I asked John McCain about your national security credentials, he cited the fact that you have commanded the Alaskan National Guard and that Alaska is close to Russia. Are those sufficient credentials?” The question was about her national security credentials. Is this really an answer to that? **We have trade missions back and forth. Ms. Couric asked the governor if she had ever been involved in negotiations, for example, with her Russian neighbors. In fact, since she took over the governor’s office, there have been no trade missions with Russia. **I know in a McCain-Palin administration we will not stand for any measure that would result in a woman being paid less than a man for equal work. Perhaps she ought to know that her running mate opposed the Ledbetter Fair Pay act saying women “need the education and training, particularly since more and more women are heads of their households.” He actually skipped the vote for this act though Obama and Clinton left the campaign trail to go to Washington for the vote. ** I’ve never heard Henry Kissinger say, “Yeah, I’ll meet with these leaders without preconditions being met.” In fact, Former Secretary of State Henry Kissinger said the U.S. should negotiate directly with Iran over its nuclear program and other bilateral issues. “One should be prepared to negotiate, and I think we should be prepared to negotiate about Iran,” Kissinger, who brokered the end of the 1973 Yom Kippur war and peace talks with the North Vietnamese, said yesterday in an interview with Bloomberg Television. Asked whether he meant the U.S. should hold direct talks, Kissinger, 84, responded: “Yes, I think we should.” Bloomberg Kissinger has gone back on this since Palin was caught in her misstatement, but the transcripts show he did say what Obama said.